Owls are carnivorous and will eat rodents, small or medium sized mammals, nocturnal insects, fish and other birds, including smaller owls. After digesting their food, owls regurgitate hard pellets of compressed bones, fur, teeth, feathers and other materials they couldn’t digest. Ornithologists study those pellets to learn more about an owl’s diet.multiple dimensions. Many owl species have asymmetrical ears. 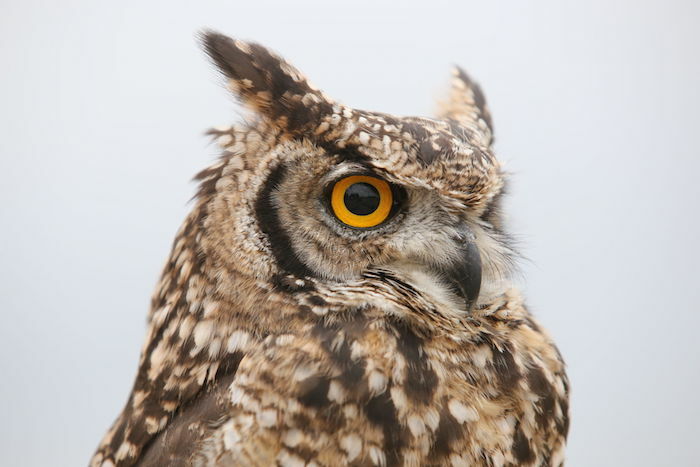 When located at different heights on the owl’s head, their ears are able to pinpoint the location of sounds in multiple dimensions. The eyes of an owl are not true “eyeballs.” Their tube-shaped eyes are completely immobile, providing binocular vision; which fully focuses on their prey and boosts depth perception. Owls hunt other owls. Great Horned Owls are the top predator of the smaller Barred Owl. The tiniest owl in the world is the Elf Owl, which is 5 – 6 inches tall and weighs about 1 ½ ounces. The largest North American owl, in appearance, is the Great Gray Owl, which is up to 32 inches tall. The Northern Hawk Owl can detect—primarily by sight—a vole to eat up to a half a mile away. Barn Owls swallow their prey whole—skin, bones, and all—and they eat up to 1,000 mice each year. Owls are found in all different habitats and there are different owl species found on all continents except Antarctica. 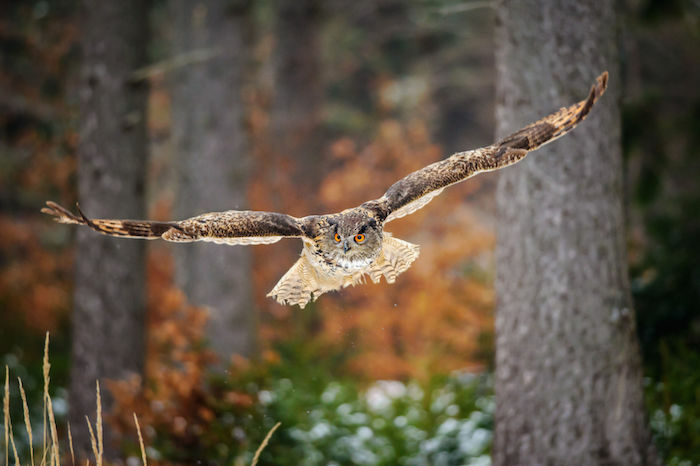 The greatest number of owl species are found in forested habitats, but they can be found anywhere prey is abundant. All owls have upright posture and forward-facing eyes that give them binocular vision, just like humans. Owls’ eyes are not spheres, however, but are tubes that provide better depth perception and allow them to see prey from great distances, but up close their vision is not as clear. Several owl species have ear tufts on their heads but they aren’t ears at all. These tufts of feathers may indicate the bird’s mood, help keep it camouflaged by mimicking branches or leaves or be used to show aggression. The flattened facial disk of an owl funnels sound to the bird’s ears and magnifies it as much as ten times to help the owl hear noises humans can’t detect. In fat years when mice are plentiful, usually monogamous Boreal Owls are apt to be promiscuous. Because easy prey means less work for parents feeding their young, males have been caught mating with up to three females, while females have been seen with at least one beau on the side. An owl has three eyelids: one for blinking, one for sleeping and one for keeping the eye clean and healthy. The third eyelid is also called the nictitating membrane, and many other birds also have it. Owls have zygodactyl feet with two toes pointing forward and two toes pointing backward, and all their toes have sharp talons. This gives the birds a stronger, more powerful grip so they can be more effective predators. Not all owls hoot, and owls can make a wide range of other sounds, such as screeches, whistles, barks, growls, rattles and hisses. During the nesting season, owl calls can often be heard up to a mile away. Female owls generally have higher voices than their mates. Not all owl species are nocturnal. How often an owl is seen during the day depends on the seasonal amount of daylight and darkness, food supplies and habitat. In times of stress or when food is low, owls may hunt at any time, just to get enough food. Owls have long been cultural symbols and they have been found in cave paintings in France, in Egyptian hieroglyphics and even in Mayan art. Today, owl superstitions associate the birds with bad luck, death and stealing souls in many cultures. The biggest modern threats to owls are habitat loss, pesticides that poison the birds and their food supplies and human persecution because of negative superstitions. Vehicle collisions, wire fences and even well-meaning birders can also be hazardous to owls. For most owl species, females are larger, heavier and more aggressive than males. If the birds are dimorphic, the female is often more richly colored than the male.